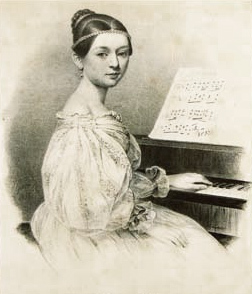 Clara Schumann (13 September 1819 – 20 May 1896). At least among pianists, she usually goes by her first name only: Clara! Her father named her so already before she was born. Friedrich Wieck had decided that if he got a daughter, she should be called Clara – meaning bright, shining – because she would become a bright and shining star on piano heaven. Wieck was confident that his clever guidance would bring her there. When his wife, Marianne Tromlitz, divorced him (!) in 1824, he – as any man would at that time – was awarded sole custody over Clara. It seems that Wieck commenced her daily music lessons from about this point. Clara’s rapid progress made her an excellent emblem of her father’s authority as a pedagogue. He also made sure that she studied counterpoint, harmony, composition, music theory, violin and singing. In other words, she received a thorough and splendid music education early on; this was unheard of for women and rare even for men. (My translation; from Die Pädagogik als System. Ein Grundriss von Karl Rosenkranz, Doctor der Theologie und ordentlichem Professor der Philosophie an der Universität zu Königsberg. Königsberg, 1848, pp. 102-03). Rosenberg’s sarcasm regarding the “didactic triumph” assumes the common view that girls could not understand math, theory or abstract matters. Even when comparing study plans from the Leipzig conservatory, it is clear that the curriculum of music theory around 1850 was easier for women than for men! As we already have understood, Friedrich Wieck did not comply with contemporaneous expectations in this regard. (Let’s appreciate that!). In a time when women should play the piano to prove themselves worthy of a providing husband, Mr. Wieck provided Clara with an education equaling that of the greatest composers. Other girls could play a few tunes to entertain, but Clara was a professional musician every sense of the word before other girls had packed away their Barbie dolls (well, you know what I mean!). At 9, she made her public debut in her hometown Leipzig and at 11, she made her first tour to Paris. By this time, her opp. 1 and 2 were published, testifying of an impressive technique for her age, and a secure grasp of harmony and form. Ha, ha! I hear you think, there we go! A letter from the girl who forgot what she promised. Oh no, she does remember. Read on and see why I did not write any earlier. On the same day as the concert at Molique’s I got ill with scarlet fever. Until a few days ago, I could do nothing but stay in the boring bed. Yet, it turned out to be a rather light attack, meaning that I can be up a few hours per day and play the piano again. But I had to cancel the concert at the Concert house. These excerpts certainly testify of her unusual discipline, diligence and professional approach to rehearsing and composing – her age (and gender!) taken into account. As you understand, her entire life cannot possibly be covered in a single blog post. With this little appetizer, I just wanted to spark your curiosity! 120 years after her death, music history still bears Clara’s footprints, and she is remembered as an excellent pianist, teacher and composer – as well as the wife and editor of Robert Schumann and mother of his eight children. What would she answer if we asked her whether a woman can “have it all”? She would probably say “Sure, you can! But keep in mind that neither romantic holidays (or any holidays! ), girls’ nights out, taking the kids to amusement parks or simply enjoying a relaxing day by yourself are part of the deal”. Please join me in commemorating Clara Schumann!